The Person Number model presented in this article elaborates on the Natural Persons model. Ideally all Natural Persons are formally related to one or more Sovereign States. In reality they can be related and in case they are, they are assigned a Person Number. The Systematic Information Model (SIM) presented below is not a complete model. The aim here is to show another small systematic model and to further  introduce the modeling method. There is, of course, (much) more to say/model about Register Persons and Person Numbers; later models will extend/refine the model presented here. In order to understand and appreciate the Person Number systematic model presented in this article, you are strongly advised to study the model Natural Persons first. 1. A Natural Person can be related to a Sovereign State. 2. In the context of such relatedness the Natural Person manifests (i.e. behaves) in a very general sense as a Register Person. 3. An information detail of Register Person is Person Number. 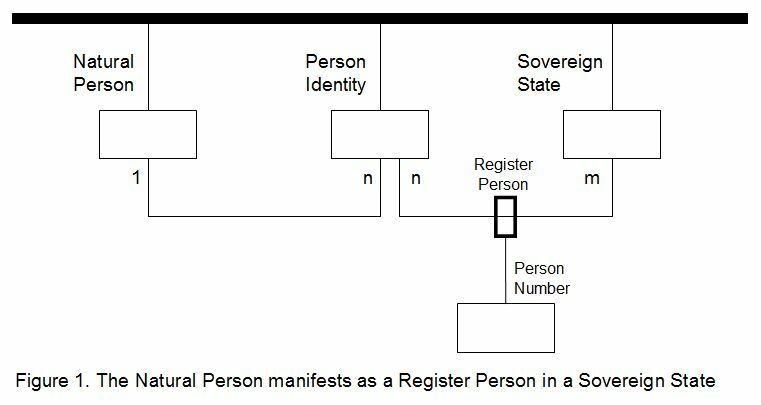 The relation (n:m) between Person Identity and Sovereign State is labeled Register Person. A standing bold rectangle – always positioned ‘in’ a relation – enables this relation to become part in contextual differentiations – i.e. to model additional situational behaviour. Such a bold rectangle is not an information node; it does not represent any information details. Person Number is the label of the relation that relates the information details with respect to Person Number to the (objectified) relation labeled Register Person. Figure 1 above identifies four information nodes (lying rectangles). In this model the information regarding Natural Persons is differentiated amongst these four nodes. The relations that relate these nodes ensure that these differentiated information details can be made available in a consistent and coherent manner. Differentiating information details amongst multiple information nodes enables us to make available various combinations of information details that are situationally relevant. This systematic information model systematically shows two manifestations of Person Identity. The first manifestation is Person Identity itself with the horizon as its context. From this first manifestation a second manifestation is derived: Register Person – the labeled relation of Person Identity with Sovereign State. The context of Register Person is built by (step 1) Person Identity and (step 2) the horizon of the model. In this model Person Number counts as the intext of Register Person. The intext of Person Identity is formed by (step 1) Register Person and (step 2) Person Number . Register Person counts as a contextual differentiation of Person identity. In case you’re not sure how to interpret Person Number, the context of Person Number is there to clarify its meaning. This context is usually available through several steps, each step providing specific (contextual) information details. Specific modeling (very likely) would attach Person Number as an attribute to Natural Person – and forget all about Person Identity. In our real world, however, it is and becomes ever more important to be systematically able to properly situate information about any natural/legal person behaviour. In a systematic model – required for use at an Information Roundabout – Person Number needs to be systematically positioned. Person Number appears to be especially meaningful in the context of Register Person, relating a Sovereign State to a Natural Person through one of his Person Identities. The information details regarding the information node Natural Person must be restricted to Natural Person related information only. Quite a lot of specific models, model an ideal world in which one Natural Person corresponds with exactly one identity (that’s why Person Number gets attached to Natural Person). For a specific model to be used in one specific situation this might be good enough. For a systematic model – to be used at an Information Roundabout as an infrastructural facility – this idealistic way of thinking  and working falls short, since every and all current as well as future situations must fit. The systematic model presented above allows Natural Persons to have more than one nationality and more than one Person Number. It allows the registration of idealistic as well as realistic (e.g. illegal) behaviour. At an Information Roundabout many participants in information traffic simultaneously need information regarding, in this case, Natural Persons. The exact combination of information details will vary over time and can hardly be foreseen. The Information Roundabout provides you, at your request, with systematically organized Natural Person information details. And you, by means of the application you’re using, combine these pieces together – serving you with the information you situationally need in your here and now. You will be situationally served with contextually appropriate information. The Person Number SIM presented here, is an extension to the Natural Persons SIM. 1. Please study the systematic information model on Natural Persons to get an introduction to the modeling concepts: “horizon”, “lying square” and “relation”. 2. For more background information on this modeling method, please study the article Metapattern. 3. The model presented here is taken from a Dutch report, (figure 1 at page 11): Stelselmatige semantiek door Suwinet (2008, Pieter Wisse). In English: “Systematic semantics by Suwinet” (Suwinet being a Dutch governmental organisation). The report aims at systematic information modeling at a (information) societal scale. 4. For an explanation of the terms “context” and “intext”, please study the article Semiotic Ennead. 5. For additional information on systematic/specific information modeling, please study the article Systematic Organisation of Information. 6. For details about the required way of thinking, please study the article Just Thinking.